in Miami Beach, it’s all about your shades. with hand lettering, vibrant colors, stylized eyewear & monster motifs. 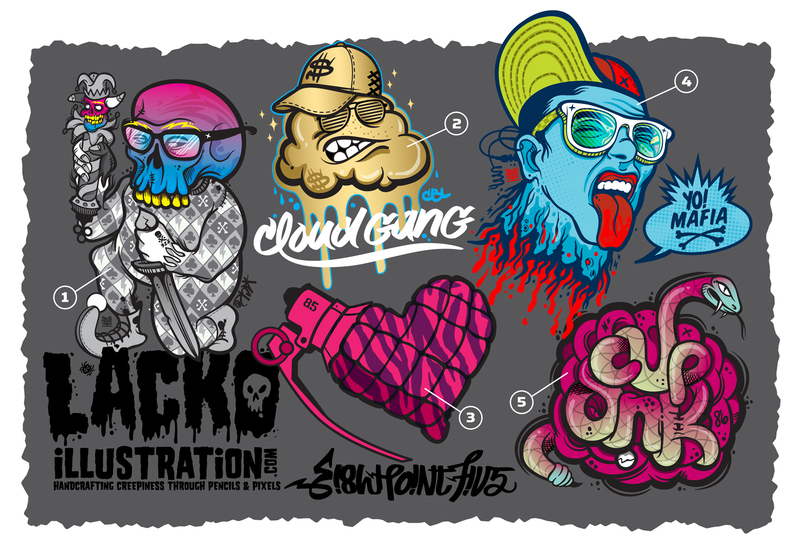 WHAT: Rapper Freck Billionaire’s “Cloud Gang” Logo. The product of a solitary 70s-era childhood, John Lacko spends his days lost in illustrative story telling and demented design thinking. His art is entirely handcrafted using needles, pencils and pixels. See more of his work on his website and Altpick page. This entry was posted in Altpick, Art, Illustrations and tagged dj, eyewear, graffiti, hand drawn lettering, illustrations, jesters, jokers, lacko, monster, skulls, snakes. Bookmark the permalink.